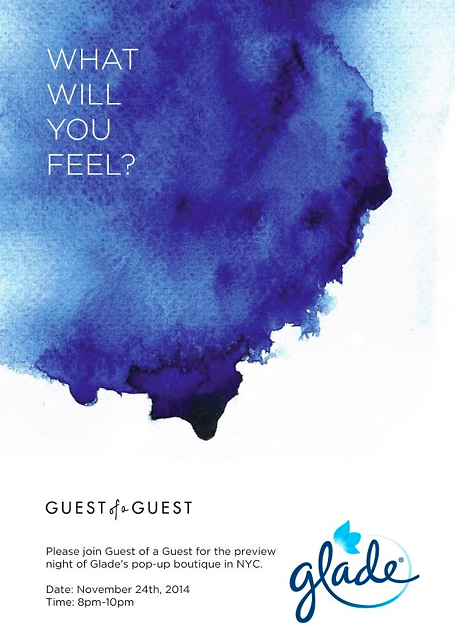 Exclusive Invite For GofG's Party With Glade® On Monday! Guest of a Guest is teaming up with Glade® for the very first time to host our own VIP night at the Glade® Boutique in NYC. We're giving 10 lucky GofG readers a chance to discover how scent has the power to make you feel and join us on Monday, November 24th. Find out how you can snag this exclusive invite below. Who knows what you will feel? What is the Glade® Boutique? The Glade® Boutique is custom-designed around feelings instead of merchandise and features a spectrum of scent-inspired experiences, all of which promise to ignite the senses and provoke imagination in a new and inspired way. Created with the help of noted interior and architectural designer Stephanie Goto, and accomplished fashion designer, Pamela Dennis, the Glade® Boutique brings emotion and feeling to life is an engaging, immersive retail experience. It's time to discover your true feelings with the following Glade® signature scents: Hawaiian Breeze® for when you need to relax, Clean Linen® inspiring fresh and new, flirty feelings with Blooming Peony and Cherry TM , Red Honeysuckle Nectar® for an energizing experience, and Sparkling Spruce® for a wonderful sense of anticipation. Go HERE to find out more about the Glade® Boutique. This post was sponsored by Glade. Go HERE for our official contest rules.